Did you ever get a pair of jeans or a shirt that you liked, but didn't quite fit you perfectly? That happened to me a few months ago. The jeans looked good, and they were very well made, but it took a while before I was comfortable wearing them. 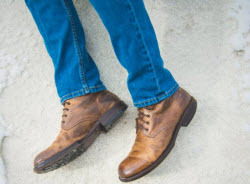 I much prefer it when I can get a pair with a perfect fit, that feel like I was born in them, with no period of "adjustment." So which pair do you think I wear more often...the older pair that fits me like a glove, or the newer ones that aren't quite as comfortable? You already know the answer, because I'll bet you have a favorite pair of jeans, too. So what does all this have to do with statistical software? Just this: if you can get statistical software that's perfectly matched to how you're going to use it, you're going to feel more comfortable, confident, and at ease from the second you open it. We do strive to make Minitab Statistical Software very easy to use from the first time you launch it. Our roots lie in providing tools that make data analysis easier, and that's still our mission today. But we know a little bit of tailoring can make a garment that feels very good into one that feels great. So if you want to tailor your Minitab software to fit you perfectly, we also make that easy—even if you have multiple people using Minitab on the same computer. If you're like most people, you want software that gives you the options you want, when you want them. You want a menu has everything organized just the way you like it. And while we're at it, how about a toolbar that gives you immediate access to the tools you know you'll be using most frequently? We don't think that's too much to ask. In my job, I frequently need to perform a series of analyses on data about marketing and online traffic. 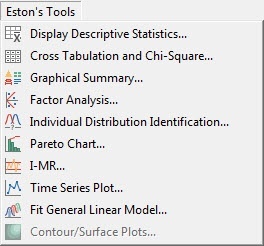 It's easy enough to access those tools through Minitab's default menus, but one day I realized I didn't even need to do that—I could just make myself a menu in Minitab that includes the tools I use most frequently. Taking this thought from idea to execution was a breeze. I simply right-clicked on the menu bar and selected the "Customize" option. That brought up the dialog box shown below. All I had to do was select the "New Menu" command and drag it from the "Commands" window to the to the menu bar, and Voila! A new menu. Pretty nifty. I could even customize the icons, were I inclined to do so. There are many more ways you can customize Minitab to suit your needs, including the creation of customized toolbars and individual profiles, which are great if you share your computer with someone who would like to have Minitab customized to their preferences, too. 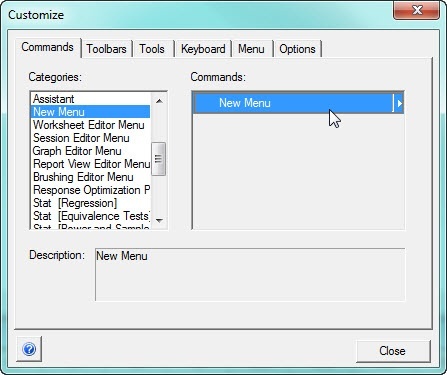 Let us know what you've done to customize Minitab so it fits you perfectly!